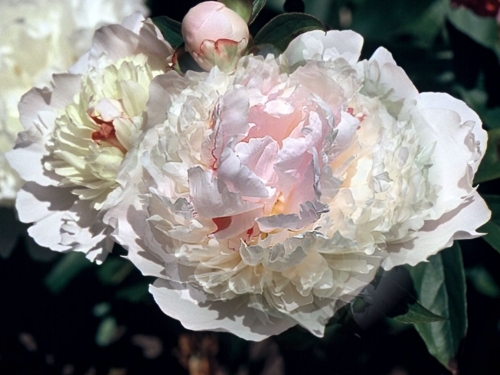 (Hoogendorn Holland 1949) Double blossoms get to 8 inches wide; buds have a pink glow, but when open the large blooms are basically creamy white with a vivid old rose pink cast to some of the petals; side blooms extend the season; a spectacular garden plant that stands up to weather. (Leola Missie Bainum/Hollingsworth 1994) Large, fully double exhibition quality blooms open with a blush then fade to white with a subtle hairline red edge occasionally; prolific in quantity of blooms and reliable in vigor and performance; strong stems up to 32 inches form a broad bush. (Hollingsworth 1992) A multitude of rounded petals form a large and lush pearlescent white double; a strong grower, fast increaser and you even get blooms on young plants; endures any weather and comes through it all smelling (mildly) like a rose; 34 inches tall. (Murawska 1943) Perfectly formed blush pink double turns ivory white with a luminocity in the center; a bouquet can scent an entire room; APS Gold Medial award in 1959. (Lemoine 1907) It sometimes takes a few days for this large globular double to fully open; the pastel blooms have a rich infusion of pale salmon pink; in warm spring weather the color is likely to pale faster; unique coloration and lovely form; dark green foliage with reddish green veins. (Kelway 1912) Large, flat blush ivory blooms have long shaggy petals that are peaked in the center with a relatively large hollow crown; blooms are long lasting and the many side buds make Exquisite one of the longest blooming peonies in our gardens; many find the blossoms very fragrant; strong stems, but, as they become loaded with blossoms, will need support; an English peony rarely available in the USA. (Crousse 1892) Pale satiny salmon-pink to coral-pink, turning and holding a rich blush coloration that seems translucent; globular bomb type flower with wide guard petals; the flowers are large and bloom in clusters; mild spice scented; 34 inches tall and a reliable bloomer. (Brand 1937) Blush pink buds open large cupped shaped double flowers of creamy pink, with deeper pink touches randomly appearing throughout the petals; height to 34 inches. (Bernstein 1942) Huge rose type double of billowing, loose soft pink petals with the strange (for a peony) enticing scent of rose geraniums; robust plant with strong stems 32 inches tall or more; grows wide rather quickly; because several blooms per stem can get so heavy, some support is recommended.